Josephine Borut is on the Board of Directors of the Long Island Horticultural Society. 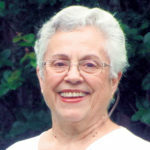 She is also a member of The American Rose Society, The Herb Society of America and The American Horticultural Society. Her monthly columns for Anton Media Group provide insight into growing and maintaining healthy gardens on Long Island.